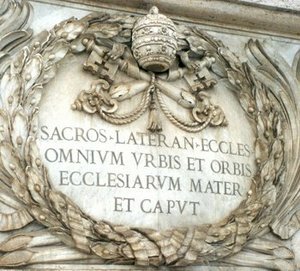 Today’s festival invites us, in some way, to cross the threshold of the Lateran Basilica and enter the nave, to stand in the midst of it and, with eyes wide open to things visible, begin to contemplate the invisible: the mystery of the Church, Bride of Christ and Mother of Christ’s faithful. To do this, we need not take ourselves off to Rome. It is enough, and more than enough, to enter into the wealth of antiphons, responsories, readings, hymns, and prayers that make up the splendour of today’s liturgy. The liturgy summons us today us to make a pilgrimage of the heart. It is full of mysterious archetypes: thresholds and doors, stones and ladders, pillars and gates, fires and storms, trumpet blasts and mountains, water and blood. All of these resonate to the great central affirmation of the liturgy of the Dedication of a Church: “God is in his holy place” (Ps 67:6). “I saw the holy city, the new Jerusalem, coming down out of heaven from God, prepared as a bride adorned for her husband” (Rev 21:2). 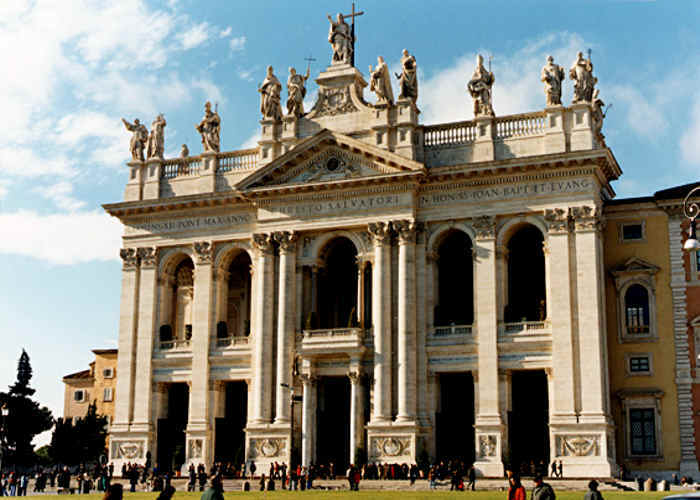 One cannot go out the front door of Santa Croce in Gerusalemme without seeing the Lateran Basilica. One never tires of the sight. The cathedral of Rome has a quiet pearly radiance in the morning light. Today’s responsorial psalm expresses it perfectly: “God is in her midst; she shall not be disturbed; God will help her at the break of dawn” (Ps 45: 6). 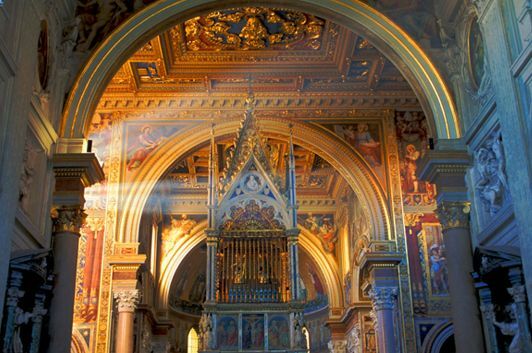 In the evening the cathedral of Rome turns to gold in the fires of the setting sun. “I have chosen and consecrated this house, says the Lord, that my name may be there forever” (2 Chr 7:16). 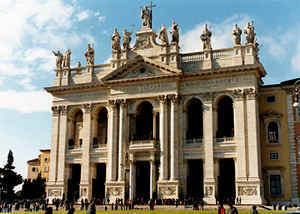 Saint John Lateran looks very much like a great vessel come down from heaven, like the bride made lovely for her spouse. prepared as a bride adorned for her husband (Rev 21:2). Behold the tabernacle of God among men! and God himself with them shall be their God (Rev 21:3). for the building up of the heavenly Jerusalem. Opening the Catechism of the Catholic Church this morning, I discovered that among the ecclesiastical writers cited in the text, there are fifty–nine men and eight women. Three of the eight women cited are Carmelites, and one of the three is Blessed Elizabeth of the Trinity: an outstanding honour for a young nun who died, hidden in her Carmel at Dijon, at twenty–six years of age on November 9, 1906. 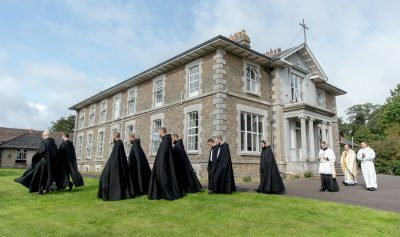 One hundred years have passed since, faced with death, Blessed Elizabeth said, “Je vais à la Lumière, à l’Amour à la Vie — I am going to Light, to Love, to Life.” The influence of the young Carmelite has grown prodigiously all over the world. 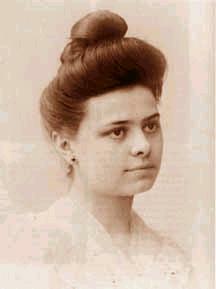 Her Prayer to the Holy Trinity has been translated into thirty–four languages. At the end of the homily today I prayed Blessed Elizabeth’s prayer; her text has a way of establishing the soul in silence. After Mass the faithful came forward to venerate the relic of Blessed Elizabeth of the Trinity. I am always moved by the tenderness and faith that people bring to the veneration of holy relics. One senses the nearness of the saint in the most remarkable way. to meet Christ on the way.